On 11/30/2017, Pedro Vargas stole a white Toyota Tacoma pickup. 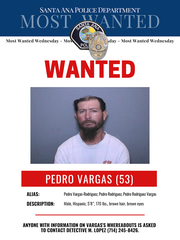 Pedro was captured on surveillance video driving the stolen truck while committing multiple commercial burglaries in the City of Santa Ana. On 01/28/2018, the victim of the stolen vehicle located his truck occupied by Vargas at a strip mall. The victim confronted Vargas, who put the vehicle in reverse and accelerated in the victim’s direction. Vargas then fled the area and the vehicle was later recovered unoccupied, a few blocks away. Suspect Vargas is wanted for multiple felony crimes committed in the City of Santa Ana and has a $25,000 warrant out for his arrest. Anyone with information on Vargas’s whereabouts is asked to contact Detective M. Lopez (714) 245-8426.